Heat oil in a large frying pan over medium heat on a camp stove, or over a charcoal or wood-fired grill heated to medium (350°; you can hold your hand 5 in. above cooking grate only 7 seconds). Add onion and cook until deep golden and very tender, stirring frequently, about 20 minutes. Grill hot dogs until slightly charred all over, about 6 minutes, turning occasionally. Add buns and grill, turning frequently, until warmed and lightly charred, about 3 minutes. 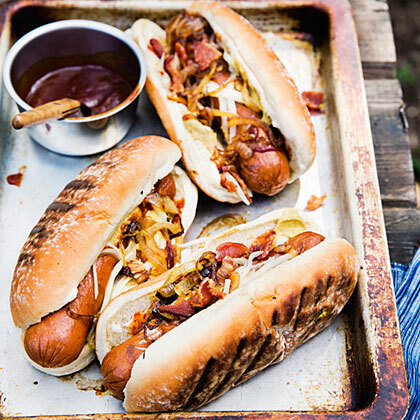 *Find bison hot dogs at highplainsbison.com or Whole Foods Market.